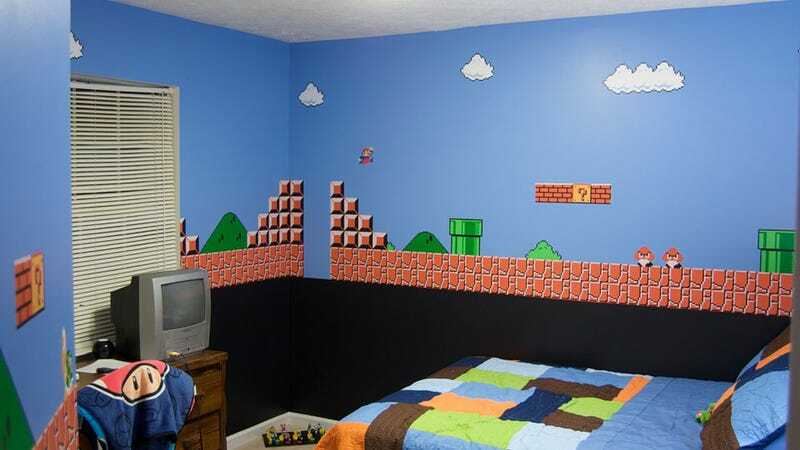 Casey Fleser and his wife thought it would be cool to paint their son's room in a Super Mario Bros. theme. So they did. And the end result makes the word "theme" sell it a little short. The room doesn't just have a few bits of Mario-related stuff thrown up on the wall. No, this kid now sleeps in World 1-1 of the classic Nintendo game, from the bottom of the lowest blocks to the top of its bright blue sky. Casey, Mrs. Fleser, if you take commissions, Kotaku Tower's lobby could do with a Dragon Roost Island theme, thanks.